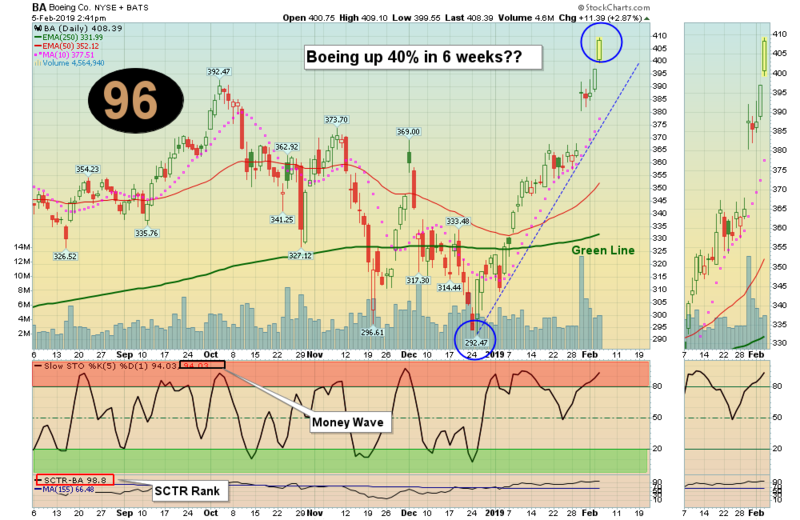 Boeing is up 40% in 6 weeks? Markets were up again today on more low Volume as Investors continued to Buy without regard to risk. The Boeing Chart above shows how quickly emotions can change the value of a Large Company by 40%. The S&P 500 is currently very Over-bought on the Short Term after a 16% bounce up from the Lows. Markets have not pulled back enough to create any new Buy Signals. Please be patient and WAIT for Money Wave Buy Signals. Most of the Leaders are back up in the Red Zones (probably too late to Buy for the Short Term). Crude Oil was down $0.80 today at $53.75. The Following Investments will probably have a Money Wave Buy Signal soon. (Slow Stochastic Closing > 20) on today’s Close. VHC VIRNEX X HOLDING CO. Buy when it Closes above the Pink Line (10-day avg.) of $5.13 on HIGH VOLUME. Please be patient and wait for Money Wave Buy Signals. We will email you when they are ready. Click on Watch List. Emotions are very high now, so please do not Buy unless you are VERY NIMBLE. The Leaders are Way Above the Green Lines (all Investments eventually return to their Green Lines). Please Check PORTFOLIO (Open Positions) and adjust your Sell Stops. Many like to Buy the day before, near the Close, if the Money Wave is going to create a Buy Signal (Closing > 20). Don’t Buy if the Investment has already popped up too much. Money Wave Buys are usually good for a 3-6 % move in a few days. We will “Not Log” trades if the Reward/Risk is not at least 2:1.